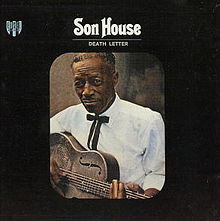 "Death Letter" is a song about a man who receives a letter that his love has died. He doesn't realize how much he loves her until he sees her being . He goes home grief stricken and missing his love. He then decides he needs to change his way of living so he "don't have to cry no more." I think the death, grief and regret aspects do well sung to the blues. Interestingly, I found several different lyrics for this song. The ones below don't completely match the song performed below. Apparently House would often change the tempo and lyrics of his songs and would even perform the same song more than once in the same concert. The lyrics are apparently a long version of the song. If you are interested in hearing The White Stripes version, there is a video here which is quite good depending on what you like. You know it said Hurry, hurry, how come the gal you love is dead? Check out Guitar Shorty......he's got some interesting lyrics. That's one long blues song. Feeling sad and blue? That's what love can do. Nothing like the blues when your sky is falling. Your analysis is spot on; death, grief and regret are found here. But one can imagine that getting it down and singing it, would likely be therapeutic beyond measure! Relief and release from suffering is implicit in the Delta Blues style.